In this paper, we consider a ( 3 + 1 ) -dimensional Boiti-Leon-Manna-Pempinelli equation. We employ the Hirota bilinear method to obtain the bilinear form of the ( 3 + 1 ) -dimensional Boiti-Leon-Manna-Pempinelli equation. 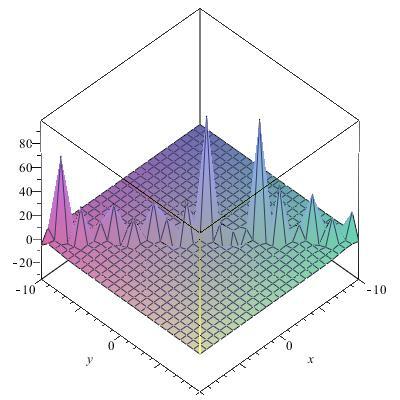 Based on the bilinear form, we derive exact three-wave solutions by using an extended three-soliton method. In addition, we also get the trajectory of some solution with the help of MAPLE. 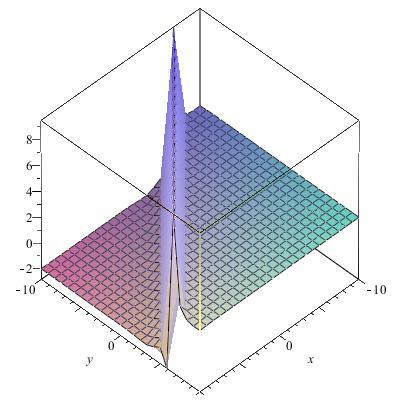 Integrable systems and nonlinear evolution equations [1–9] have attracted much attention of mathematicians and physicists. Especially, exact solutions of nonlinear evolution equations play a pivotal role in the study of mathematical physical phenomena. Not only can these exact solutions describe many important phenomena in physics and other fields, but they can also help physicists to understand the mechanisms of the complicated physical phenomena. 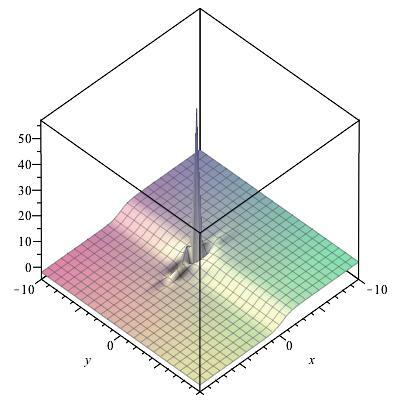 A variety of powerful methods have been employed to study nonlinear phenomena, such as the inverse scattering transform , the tanh function method , the extended tanh-function method , the homogeneous balance method , the auxiliary function method , and the exp-function method , the Pfaffian technique , the dressing method , the Bäcklund transformation method , the Darboux transformation , the generalized symmetry method, the tri-function method  and the G ′ / G -expansion method , the modified CK direct method . Very recently, Dai et al. proposed a new technique called the three-wave approach to seek periodic solitary wave solutions for integrable equations . The method is to use Frobenius’ idea  to reduce the PDE into integrable ODEs. Frobenius’ idea was successfully used to establish the transformed rational function method  and to solve the KPP equation . In fact, the Tanh function method and the G ′ / G expansion method are special cases of the reduction idea raised in , say, the general Frobenius idea. Furthermore, a three-wave solution in ( 3 + 1 ) -dimension was obtained by using the multiple exp-function method [27, 28]. With the rapid development of computer technology and the help of symbolic computation, this approach is of utmost simplicity. Hence, it can be applied to many kinds of nonlinear evolution equations and higher-dimensional soliton equations. Zitian Li obtained periodic cross-kink wave solutions, doubly periodic solitary wave solutions and breather type of two-solitary wave solutions for the ( 3 + 1 ) -dimensional Jimbo-Miwa equation by this method . 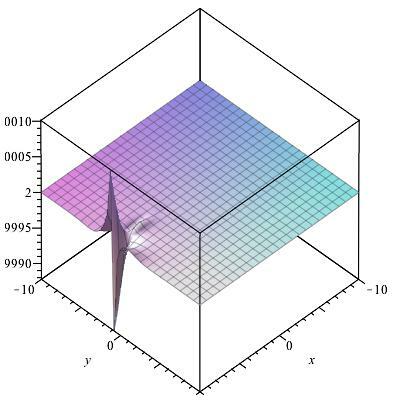 Wang applied the method to a higher dimensional KdV-type equation . where u = u ( x , y , t ) and subscripts represent partial differentiation with respect to the given variable. Boiti et al. also discussed the Painlevé property, Lax pairs and some exact solutions of ( 2 + 1 ) -dimensional BLMP. Through the Bäcklund transformation, Bai and Zhao got some new solutions of the BLMP equation. By means of the multilinear variable separation approach, a general variable separation solution of the BLMP equation was derived in . Liu proposed a simple Bäcklund transformation of a potential BLMP system by using the standard truncated Painlevé expansion and symbolic computation, and a solution of the potential BLMP system with three arbitrary functions was given in . 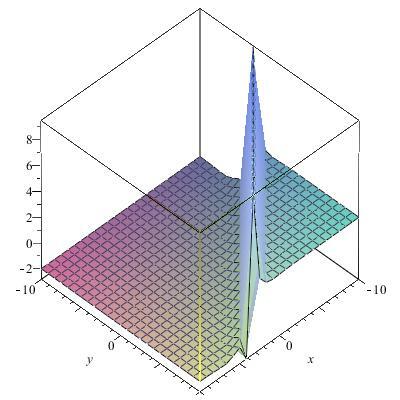 The symmetry, similarity reductions and new solutions of the ( 2 + 1 ) -dimensional BLMP equation were obtained in . These solutions include rational function solutions, double-twisty function solutions, Jacobi oval function solutions and triangular cycle solutions. 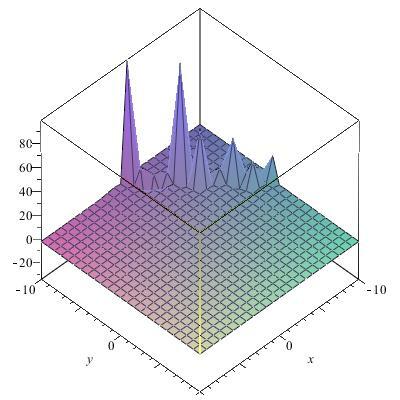 In , based on the binary Bell polynomials, the bilinear form for the BLMP equation was obtained. 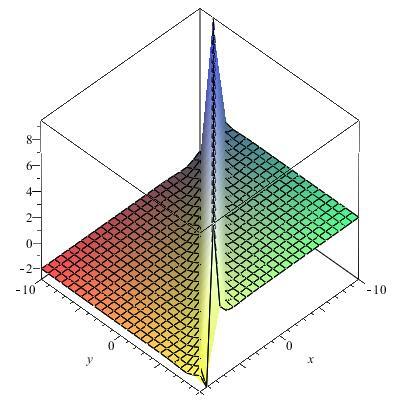 The new exact solutions were derived with an arbitrary function in y, and soliton interaction properties were discussed by the graphical analysis. The author in  discussed the BLMP equation and generalized breaking soliton equations by using the exponential function and obtained some new exact solutions of the equations. By using the modified Clarkson-Kruskal (CK) direct method, Li et al. constructed a Bäcklund transformation of the ( 2 + 1 ) -dimensional Boiti-Leon-Manna-Pempinelli (BLMP) equation. Laurent Delisle and Masoud Mosaddeghi proposed the study of the BLMP equation from two points of view: the classical and the super symmetric. They constructed new solutions of this equation from Wronskian formalism and the Hirota method in . which was introduced by Darvishi in . We apply the extended three-soliton method to the ( 3 + 1 ) -dimensional Boiti-Leon-Manna-Pempinelli equation, obtaining more exact solutions including a complexiton solution, periodic cross-kink solutions about it. where P is a polynomial in its arguments. The solution method will also work for systems of nonlinear equations and high-dimensional ones. D t m D x n a ( t , x ) ⋅ b ( t , x ) = ∂ m ∂ s m ∂ n ∂ y n a ( t + s , x + y ) b ( t − s , x − y ) | s = 0 , y = 0 .
where F is a polynomial in its arguments. 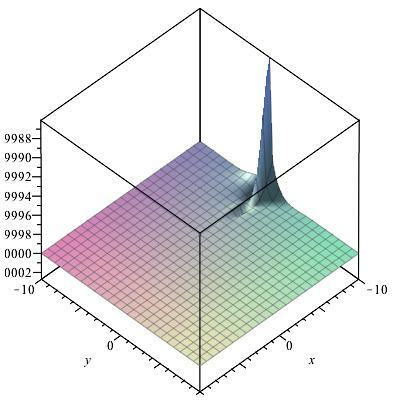 where ξ = p 1 ( x + γ 1 z + β 1 y + α 1 t ) , η = p 2 ( x + γ 2 z + β 2 y + α 2 t ) , θ = p 3 ( x + γ 3 z + β 3 y + α 3 t ) and p i , α i , β i , γ i ( i = 1 , 2 , 3 ) are free constants to be determined later. Step 3. Substituting Eq. (6) into Eq. (5), and collecting the coefficient of sinh ( η ) cos ( ξ ) , sinh ( η ) exp ( θ ) , sinh ( η ) exp ( − θ ) , cosh ( η ) sin ( ξ ) , cosh ( η ) exp ( θ ) , cosh ( η ) exp ( − θ ) , sin ( ξ ) exp ( θ ) , sin ( ξ ) exp ( − θ ) , cos ( ξ ) exp ( θ ) , cos ( ξ ) exp ( − θ ) to zero, we can derive a set of algebraic equations for a − 1 , a 1 , a 2 , p i , α i , β i , γ i ( i = 1 , 2 , 3 ). Step 4. Solving the set of algebraic equations defined by Step 3 with the help of MAPLE, we can derive parameters a − 1 , a 1 , a 2 , p i , α i , β i , γ i ( i = 1 , 2 , 3 ). Therefore, we can obtain abundant exact multi-wave solutions of Eq. (3). ( u y + u z ) t + ( u y + u z ) x x x − 3 u x ( u y + u z ) x − 3 u x x ( u y + u z ) = 0 . − f y f t − f z f t − f x x x f y − 3 f x x y f x + 3 f x x f x y − f x x x f z − 3 f x x z f x + 3 f x x f x z + f y t f + f z t f + f x x x y f + f x x x z f = 0 . ( D y D t + D z D t + D y D x 3 + D z D x 3 ) f ⋅ f = 0 . − a 2 2 p 2 2 α 2 β 2 − a 2 2 p 2 2 α 2 γ 2 − p 1 2 α 1 β 1 − p 1 2 α 1 γ 1 − 4 a 2 2 p 2 4 β 2 − 4 a 2 2 p 2 4 γ 2 + 16 a − 1 p 3 4 a 1 β 3 + 16 a − 1 p 3 4 a 1 γ 3 + 4 a − 1 p 3 2 β 3 a 1 α 3 + 4 a − 1 p 3 2 γ 3 a 1 α 3 + 4 p 1 4 β 1 + 4 p 1 4 γ 1 = 0 . Solving the above algebraic equations with the help of MAPLE gives the following solutions. a − 1 = a − 1 , a 1 = a 1 , a 2 = a 2 , p 1 = 0 , p 2 = 0 , p 3 = p 3 , α 1 = α 1 , α 2 = α 2 , α 3 = − p 3 2 , β 1 = − β 2 α 1 + γ 1 α 2 + γ 2 α 1 α 2 , β 2 = β 2 , β 3 = − γ 3 , γ 1 = γ 1 , γ 2 = γ 2 , γ 3 = γ 3 .
where a − 1 , a 1 , p 3 , γ 3 are free constants. The propagation of solution u 1 is described in Figure 1. The propagation of solution u 1 with a − 1 = − 1 , a 1 = 1 , p 3 = 1 , γ 3 = 1 , z = 1 .
a − 1 = a − 1 , a 1 = a 1 , a 2 = a 2 , p 1 = p 1 , p 2 = 0 , p 3 = 0 , α 1 = p 1 2 , α 2 = α 2 , α 3 = α 3 , β 1 = − γ 1 , β 2 = − β 3 α 2 + γ 3 α 2 + γ 2 α 3 α 3 , β 3 = β 3 , γ 1 = γ 1 , γ 2 = γ 2 , γ 3 = γ 3 .
where a − 1 , a 1 , p 1 , γ 1 are free constants. 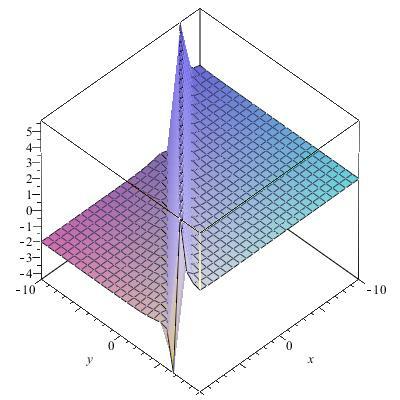 The propagation of solution u 2 is described in Figure 2. The propagation of solution u 2 with a − 1 = 1 , a 1 = 1 , p 1 = − 1 , γ 1 = 1 , z = 5 .
a − 1 = 0 , a 1 = a 1 , a 2 = a 2 , p 1 = 0 , p 2 = p 2 , p 3 = p 3 , α 1 = α 1 , α 2 = − p 2 2 , α 3 = − p 3 2 , β 1 = β 1 , β 2 = − γ 2 , β 3 = − γ 3 , γ 1 = γ 1 , γ 2 = γ 2 , γ 3 = γ 3 .
where a 1 , a 2 , p 2 , p 3 , γ 3 are arbitrary constants. a − 1 = 1 4 a 1 , a 1 = a 1 , a 2 = a 2 , p 1 = p 3 i , p 2 = 0 , p 3 = p 3 , α 1 = − p 3 2 , α 2 = − 3 p 3 2 , α 3 = − p 3 2 , β 1 = − γ 1 − β 3 − γ 3 , β 2 = β 2 , β 3 = β 2 , γ 1 = γ 1 , γ 2 = γ 2 , γ 3 = γ 3 .
where ξ = i p 3 ( x + γ 1 z + ( − γ 1 − β 3 − γ 3 ) y − p 3 2 t ) and a 1 , p 3 , α 3 , β 3 , γ 1 , γ 3 are free constants. a − 1 = a − 1 , a 1 = a 1 , a 2 = a 2 , p 1 = p 1 , p 2 = 0 , p 3 = p 3 , α 1 = p 1 2 , α 2 = α 2 , α 3 = α 3 , β 1 = − γ 1 , β 2 = − γ 2 , β 3 = − γ 3 , γ 1 = γ 1 , γ 2 = γ 2 , γ 3 = γ 3 .
where ξ 1 = p 1 ( x + γ 1 z − γ 1 y + p 1 2 t ) and a − 1 , a 1 , p 1 , p 3 , α 3 , γ 3 are free constants. a − 1 = − p 1 2 γ 1 + p 1 2 β 1 + a 2 2 p 3 2 γ 3 + a 2 2 p 3 2 β 3 4 ( β 3 + γ 3 ) p 3 2 a 1 , a 1 = a 1 , a 2 = a 2 , p 1 = p 1 , p 2 = p 3 , p 3 = p 3 , α 1 = − 3 p 3 2 + p 1 2 , α 2 = 3 p 1 2 − p 3 2 , α 3 = 3 p 1 2 − p 3 2 , β 1 = β 1 , β 2 = − γ 2 − γ 3 − β 3 , β 3 = β 3 , γ 1 = γ 1 , γ 2 = γ 2 , γ 3 = γ 3 .
where ξ 2 = p 1 ( x + γ 1 z + β 1 y + ( − 3 p 3 2 + p 1 2 ) t ) , θ 2 = p 3 ( x + γ 3 z + β 3 y + ( 3 p 1 2 − p 3 2 ) t ) , η 2 = p 3 ( x + γ 2 z + ( − γ 2 − γ 3 − β 3 ) y + ( 3 p 1 2 − p 3 2 ) t ) and a 1 , a 2 , p 1 , p 3 , β 1 , β 3 , γ 1 , γ 2 , γ 3 are free constants. a − 1 = 0 , a 1 = a 1 , a 2 = a 2 , p 1 = i p 2 , p 2 = p 2 , p 3 = p 3 , α 1 = − 4 p 2 2 , α 2 = − 4 p 2 2 , α 3 = − 3 p 3 p 2 2 + p 3 3 − 3 p 3 2 p 2 + 3 p 2 3 p 3 , β 1 = − p 3 β 3 + p 3 γ 3 + p 2 γ 1 p 2 , β 2 = − p 3 β 3 + p 2 γ 2 + p 3 γ 3 p 2 , β 3 = β 3 , γ 1 = γ 1 , γ 2 = γ 2 , γ 3 = γ 3 .
where ξ 3 = p 1 ( x + γ 1 z − p 3 β 3 + p 3 γ 3 + p 2 γ 1 p 2 y − 4 p 2 2 t ) , η 3 = p 2 ( x + γ 2 z − p 3 β 3 + p 2 γ 2 + p 3 γ 3 p 2 y − 4 p 2 2 t ) and a 1 , a 2 , p 2 , p 3 , β 3 , γ 1 , γ 2 , γ 3 are free constants. a − 1 = a − 1 , a 1 = a 1 , a 2 = a 2 , p 1 = p 1 , p 2 = p 2 , p 3 = 0 , α 1 = p 1 2 , α 2 = − p 2 2 , α 3 = α 3 , β 1 = − γ 1 , β 2 = − γ 2 , β 3 = β 3 , γ 1 = γ 1 , γ 2 = γ 2 , γ 3 = γ 3 .
where a − 1 , a 1 , a 2 , p 1 , p 2 , α 3 , β 3 , γ 1 , γ 2 and γ 3 are free constants. a − 1 = ( a 2 2 β 1 + β 1 + γ 1 + a 2 2 γ 1 ) p 2 2 4 ( β 3 + γ 3 ) p 3 2 a 1 a 1 = a 1 , a 2 = a 2 , p 1 = i p 2 , p 2 = p 2 , p 3 = p 3 , α 1 = − 3 p 3 2 − p 2 2 , α 2 = − 3 p 3 2 − p 2 2 , α 3 = − 3 p 2 2 − p 3 2 , β 1 = β 1 , β 2 = − β 1 − γ 2 − γ 1 , β 3 = β 3 , γ 1 = γ 1 , γ 2 = γ 2 , γ 3 = γ 3 .
where ξ 4 = i p 2 ( x + γ 1 z + β 1 y + ( − 3 p 3 2 − p 2 2 ) t ) , θ 4 = p 3 ( x + γ 3 z + β 3 y + ( − 3 p 2 2 − p 3 2 ) t ) , η 4 = p 2 ( x + γ 2 z + ( − β 1 − γ 2 − γ 1 ) y + ( − 3 p 3 2 − p 2 2 ) t ) and a 1 , a 2 , p 2 , p 3 , β 1 , β 3 , γ 1 , γ 2 , γ 3 are free constants. Figures 3, 4, 5, 6 described the solution of u 3 , u 4 , u 6 and u 8 respectively. The propagation of solution u 3 with a 1 = 1 , a 2 = 1 , p 2 = 1 , p 3 = 1 , γ 2 = 1 , γ 3 = 1 , z = 1 . 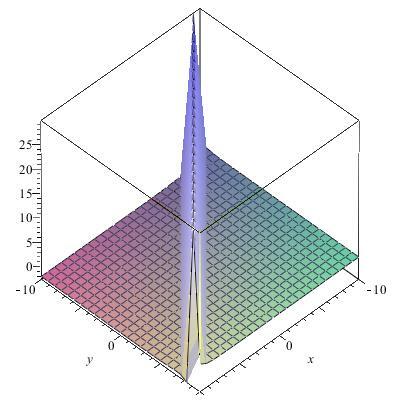 The propagation of solution u 5 with a − 1 = 1 , a 1 = 1 , p 1 = 1 , p 3 = 1 , α 1 , γ 1 = 1 , γ 3 = 1 , z = 1 . The propagation of solution u 6 with a 1 = 1 , a 2 = 1 , p 1 = 1 , p 3 = 1 , β 1 = 1 , β 3 = 1 , γ 1 = 1 , γ 2 = − 1 , γ 3 = 1 , z = 1 . The propagation of solution u 8 with a − 1 = 1 , a 1 = 1 , a 2 = 1 , p 1 = 1 , p 2 = 1 , γ 1 = 1 , γ 2 = − 1 , z = 1 . Remark 1 Noting if we set β i = − γ i in Case 1 to Case 5 of the solutions above are special solutions of the equation, we can see that for an arbitrary function, u ( x , y − z , t ) is also a solution. However, the other cases are different. Remark 2 Noting sinh ( i x ) = i sin ( x ) and cos ( i x ) = cosh ( x ) , the solutions presented in this paper can be obtained by using the multiple exp-function. Furthermore, we can get an N-soliton solution just by modifying the ansatz and using the exp expanding method . In this paper, we obtained three-wave solutions to the ( 3 + 1 ) -dimensional Boiti-Leon-Manna-Pempinelli equation with the extended three-soliton method. All the presented solutions show remarkable richness of the solution space of the ( 3 + 1 ) -dimensional Boiti-Leon-Manna-Pempinelli equation and also that the ( 3 + 1 ) -dimensional integrable system may have very rich dynamical behavior. The considered solutions are of complexiton type . There is also a generalized theory of the Bell polynomials method which describes the generalized bilinear differential equations [42, 43]. To our knowledge, our solutions are novel. They cannot be obtained just through the simple generalization of the ( 2 + 1 ) -dimensional BLMP equation. In fact, the extended three-soliton method is entirely algorithmic and involves a large amount of tedious calculations. However, the method is direct, concise and effective. 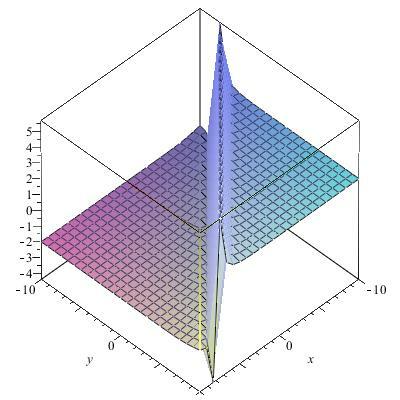 Therefore, we can apply the method to the variety of dynamics of a higher-dimensional nonlinear system and many other types of a nonlinear evolution equation in further work. The authors are in debt to thank the anonymous referees for helpful suggestions. The work is supported by the National Natural Science Foundation of China (project No. 11371086), the Fund of Science and Technology Commission of Shanghai Municipality (project No. ZX201307000014) and the Fundamental Research Funds for the Central Universities. All authors contributed equally and significantly in writing this paper. All authors read and approved the final manuscript.